Recently, I gave an assignment to my Creative Challenge class that brought up some interesting responses. The assignment was: Paint something “you” think is ugly and make it beautiful. Almost everyone questioned what I meant by ugly. Some responded that they could find beauty in almost anything. Others saw beauty in the ugly before they even began to paint. I thought all these responses were so interesting. One little assignment brought with it such thought! As it turned out, not a one of their paintings was ugly. They all achieved beauty from something they thought was ugly. This assignment made me think of something I learned from an instructor a long time ago. She said, “We all spend time creating drawings and paintings of things we love. The real learning and improvement takes place when we try something new. We have to rely on “seeing” the form, feeling the edges and become accustomed to something new.” That is what happened with me, with the above painting. I chose the snake as my “ugly”. 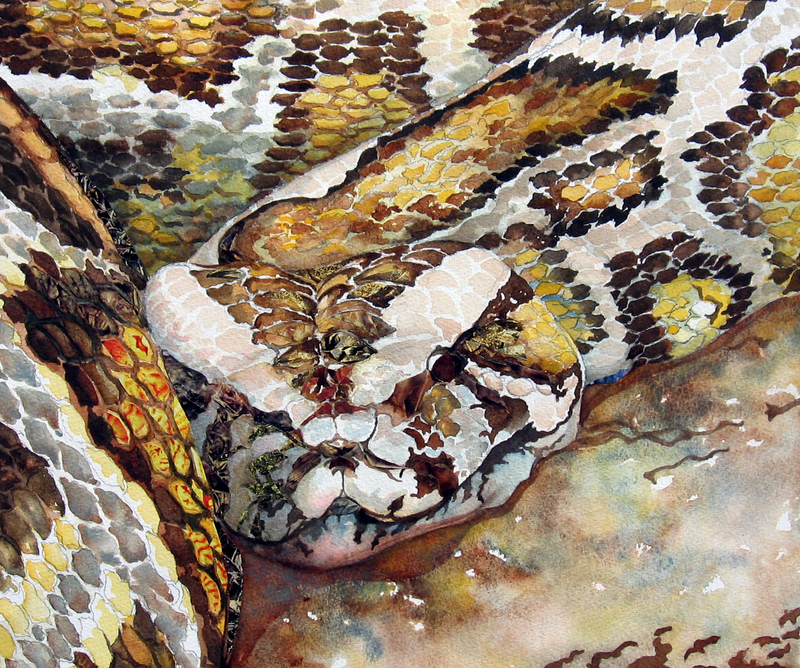 She almost immediately became beautiful when I studied all the intricate patterns and the shapes of her scales. I decided to give her a bit of a grin. The patterns of dark strips of color was there for me to do that. I learned it was not so much her looks that I thought ugly but how she had to constrict her prey and devour it whole. Just another example of how we categorize things, in our minds, without looking deeper. If you study this carefully, you can see where I added some citra- solv collage. I do not know what kind of Python this is. I did some searches and think it may be a Burmese Python by the markings. The Indian Rock Python has shapely patterns, also, but they do not seem to have that golden glow in the center of the pattern. Thank you to Wet Canvas for the reference image for this. I need to kick-start myself into painting more frequently. Everything is getting in the way! I had fun with this lion. I used a limited palette of about five colors. They were Arctic Ice, Raw Sienna, Copper Kettle, Halloween Orange and Sepia. 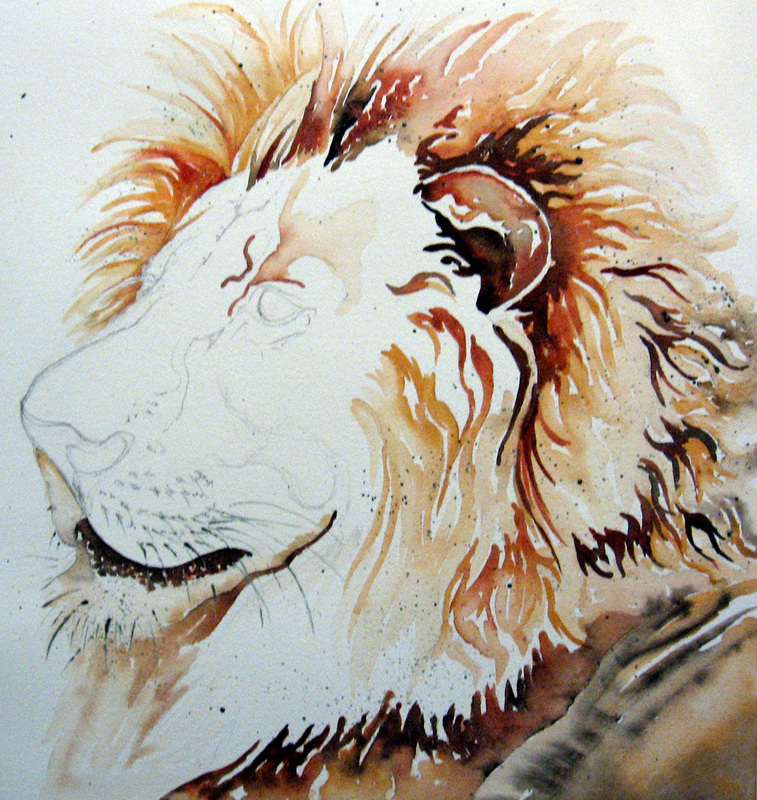 I began by cropping my reference photo so the lion’s eye was near an area that is good for a focal point. 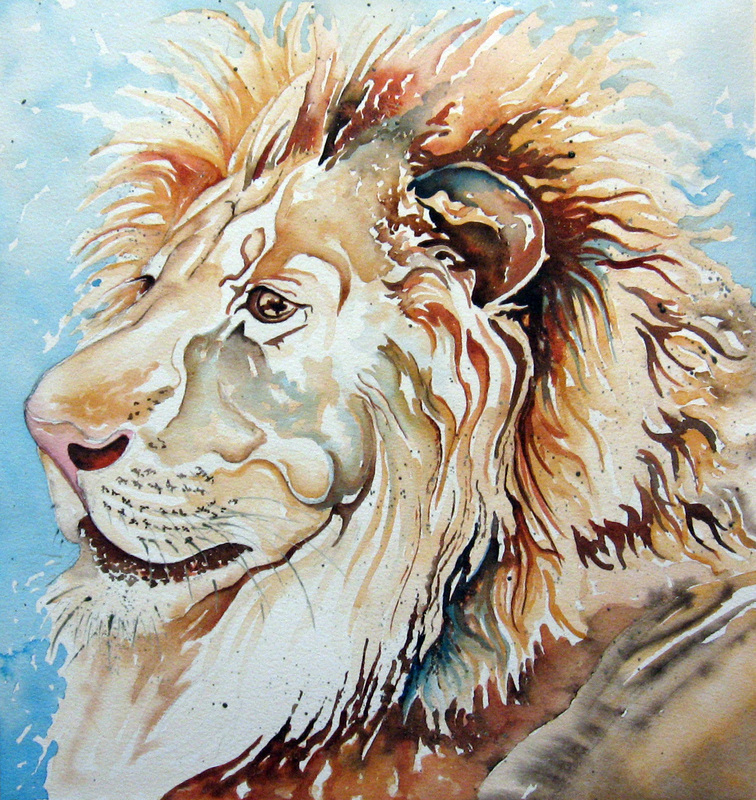 I drew the lion and splattered the surface of the painting with frisket, using a small brush. 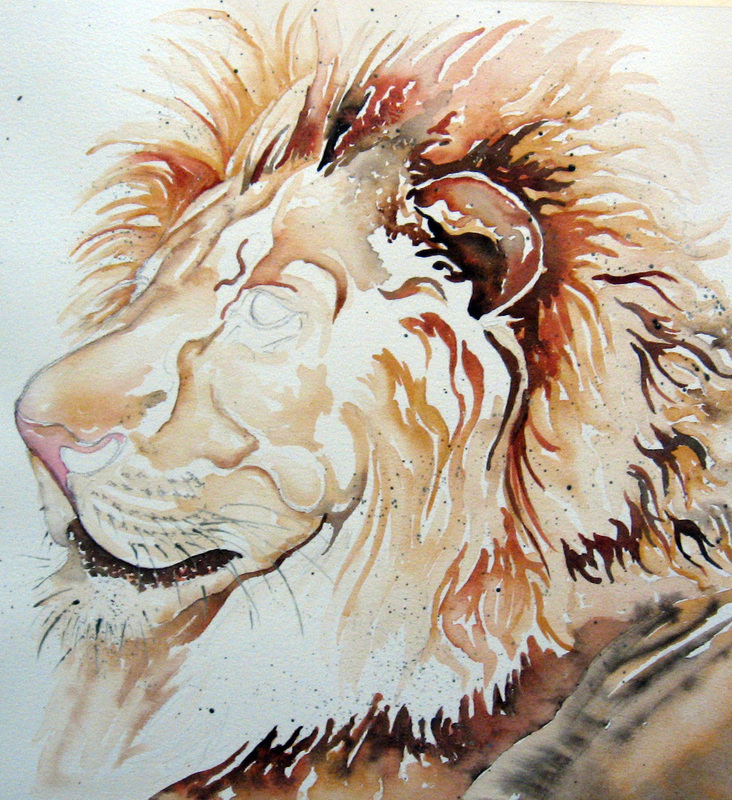 I wanted the resulting splatter to be tiny pinpricks of texture throughout the lion’s mane and shoulder. I began by mapping out where I wanted my most dominant darks. I know! Opposite of what the watercolor books say. I think that once you learn the basics, you can allow yourself some freedom of expression and there are some subjects that I build from light to dark and others where I map out the dark areas, first. I almost always push the darks even farther during my final steps in the painting. Next, I concentrated on the midtones and light wash shapes in and throughout the face area. This is where I want to draw my viewer’s eye, so I try to feel for the contours of the lion’s face, around the nose, eye, brow and muzzle. It helps to define what portions of the lion’s face bumps out and what rolls in and gives the face more of a 3-D feel and not read so flat. This is the step I washed in, very loose and wet, a background. I painted around the whisker dots on the muzzle and filled in the shapes in the eye and the nose. I added the background blue in heavy and light washes in and around the painting. I always bring my background colors into the foreground. I feel this gives a painting better balance. It takes a simple background and gives it a reason for being and helps to create a feeling that the subject is a part of the environment he is in rather than pasted on. I chose this particular blue because this painting is for a Detroit Lion fan. In the final step I do all the tiny detail work and enhance some areas. I darkened and detailed the eye. I darkened the fleshtones in the nose. I defined more shapes around the eye. I darkened and defined the muzzle around the whiskers so the frisket areas would show up. I enhanced the shadow shapes under the chin, both sides of the ear and far brow line with Halloween Orange. I darkened all the shadow shapes. I removed the frisket once the painting was dry. 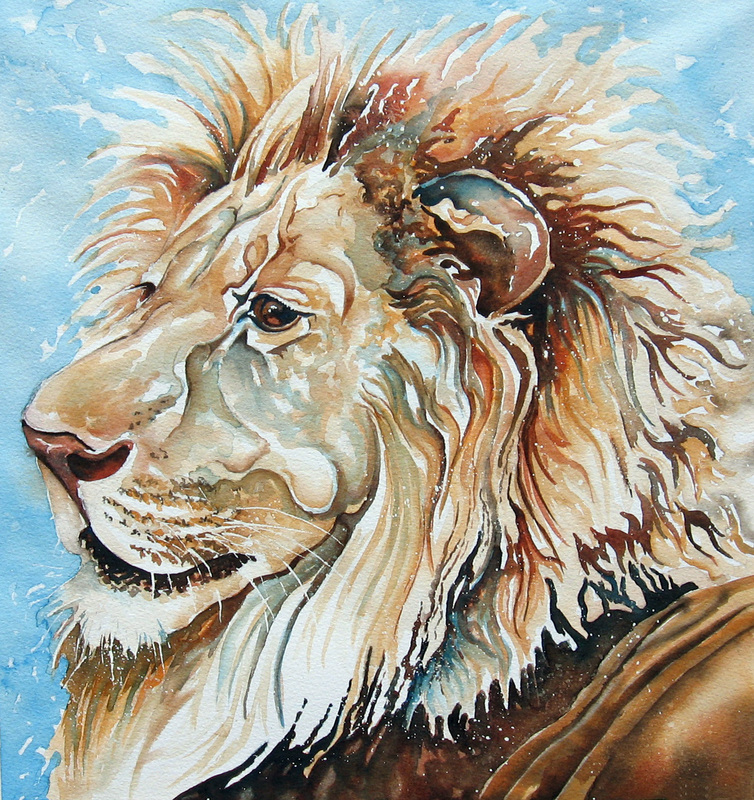 Thank you to Wet Canvas for the reference for this lion.